It’s game, set and match for the team at Keenpac, as they celebrate the successful final delivery of the Wimbledon bags early this morning. This is the third year running that Keenpac has been responsible for producing the carrier bags for this prestigious Grand Slam Tennis event, ensuring that the thousands of tennis fans to arrive through the turnstiles each day, can also take away a precious souvenir of the event. 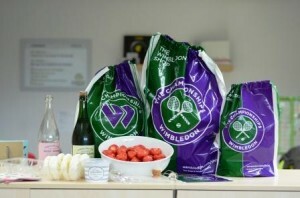 The bags themselves are emblazoned with the famous purple and green Wimbledon livery. Duffle bag style, they are produced in high quality degradable polythene, with matching green drawstrings – perfect for a sporting occasion of the magnitude of Wimbledon. This year as always, delivery timings were meticulously planned to fit into the narrow time-slot allocated, and there was a nail-biting moment when the bags were due to land – but we are pleased to announce that they arrived without a hitch! The team from Keenpac took time out this morning, to enjoy a bowl of strawberries and cream, along with non-alcoholic wine in honour of the great occasion, and to celebrate their success. 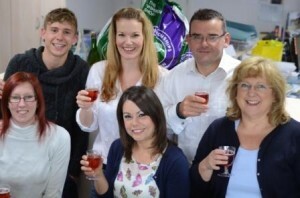 Well done to Emma Brown and the team, and here’s to Wimbledon 2014!